Note: dtSearch does not alter original files or other data, including Hash values, in indexing, searching and display of documents. dtSearch’s own document filters support parsing, indexing, searching and display with highlighted hits of text and metadata across a broad range of online and offline data types. Web-ready content: supports integrated images and text in HTML, XML/XSL, PDF, ASP.NET, CMS, PHP, WordPress, SharePoint, etc. Other databases and data sources: supports XML, Access, XBASE, CSV, etc. ; dtSearch Engine APIs support NoSQL and SQL-type databases, along with the full-text of BLOB data; dtSearch Engine APIs also support disk images, network data streams and other non-file data. MS Office formats: supports integrated browser-ready image and text in Word (RTF/DOC/DOCX), PowerPoint (PPT/PPTX), Excel (XLS/XLSX), Access (MDB/ACCDB) and OneNote (ONE); support includes documents saved from Office 365. Other “Office” formats, PDF and other printer formats, compression formats: supports other “Office” suite formats; EMF Spool (SPL) files; compression formats like RAR, ZIP, GZIP and TAR; PDF, PDF Portfolio, and many encrypted PDFs. Emails and attachments: supports integrated browser-ready images, text and attachments (including recursively embedded objects) in Outlook/Exchange (PST/OST/MSG) and Thunderbird (MBOX/EML); support includes emails saved from Office 365. 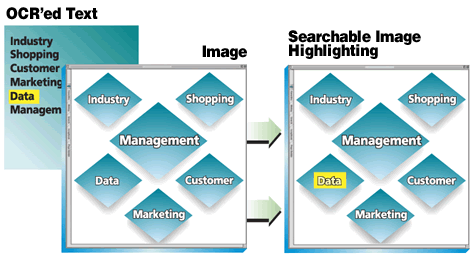 After a search, dtSearch products provide integrated relevancy ranking with highlighted hits across both online and offline data. The dtSearch Spider adds local and remote online content to a search. The Spider can index sites to any level of depth, with support for public and private or secure online content. For private or secure sites, the dtSearch Spider supports log-ins and forms-based authentication. For public sites, the dtSearch Spider is a “polite” spider and will not index and search a site with a flag that indicates it does not accept spiders or robots. For convenient offline access, the dtSearch Spider also includes a caching option, to store the full spidered content along with the index. (Without caching, the Spider has to return to the relevant URL to display the full content with highlighted hits.) The caching option can also be used with other, non-spidered data as well. PDF 2.0. More than 25 years after Adobe created the PDF file format in 1993, there is a major new version of PDF: PDF 2.0. Because this new PDF version changes the header information, dtSearch versions before 7.93 will not recognize the PDF 2.0 file format and will miss all content in these files. Therefore, it is essential to use dtSearch 7.93 or later before attempting to index and search PDF 2.0 files. Searchable PDFs. dtSearch recommends using an OCR program like Adobe Acrobat to OCR scanned images into PDF “searchable image” format. If a PDF file is an “image only” PDF (i.e. a PDF where even though you can see text, you cannot cut and paste that text), use an OCR program like Adobe Acrobat to turn the “image only” PDF into a “searchable image” PDF. The "searchable image" format works by storing the complete original image of a scanned document, along with the text obtained through OCR. The text is "hidden" in the sense that simply opening the PDF file displays only the scanned image, not the underlying OCR’ed text. Because the OCR’ed text is "hidden" in the file, however, dtSearch can index and search it. PDF Encryption. dtSearch products support indexing PDF files with 40-bit RC4, 128-bit RC4, 128-bit AES, and 256-bit AES encryption. Exception: if a PDF file has “Restrict editing and printing of the document” selected, and does not have “Enable copying ...” selected, then dtSearch products will not access that PDF file. To access security and permission settings in a PDF file, open the file in Adobe Acrobat, click File from the top menu, then select Properties and then select the Security tab. If you select Password Security from the drop-down list, one of the options is “Restrict editing and printing of the document.” If that is selected, and “Enable copying ...” is not selected, then dtSearch products will not access that PDF file until those settings are changed. Adobe Acrobat requires entering the original password to change these settings. To index encrypted PDFs that dtSearch does not support (i.e. PDFs with the “Enable copying ...” permission disabled or PDFs requiring a separate password), make a temporary, decrypted copy of the encrypted files, index the decrypted copy, and then replace the temporary decrypted copy with the encrypted versions. This one-time unencryption is sufficient for dtSearch operation. dtSearch does not need to unencrypt the PDF files to search and display them with highlighted hits once the original index is complete. Developers: PDF encryption support is implemented in a new component, dtv_pdfCrypto.dll, that is subject to export restrictions. Please see Section 12.4 of the dtSearch setup license agreement for more information. dtSearch Desktop/Network: Click Options > Preferences > Filtering Options, and check the "Filter text" option under "Binary files" to enable filtering of binary files. dtSearch developer API: Set Options.BinaryFiles = dtsoFilterBinaryUnicode. dtSearch products offer several options for indexing and searching emails and other messages, contacts, appointments and the like. All methods support indexing, searching and display with highlighted hits of item content, metadata and attachments, including multilevel nested email attachments. Options for indexing Outlook and Exchange messages. Fuzzy searching uses a proprietary algorithm to find search terms even if they are misspelled. dtSearch recommends fuzzy searching for searching emails, OCR’ed text, or any other text that may contain misspellings. Starting in V. 7.86, dtSearch has an option to generate an MD5 hash for each document as it is indexed and append the field to the document text as searchable metadata. Starting in V. 7.87, dtSearch has an option to generate an SHA-256 hash for each document as it is indexed and append the field to the document text as searchable metadata. As with other dtSearch indexing operations, this process will not alter the original files or their hash values. This option will, however, make indexing slower. dtSearch Desktop/Network: Click Options > Preferences > Indexing Options, and check "Generate and index MD5 hashes for documents" or "Generate and index SHA-256 hashes for documents"
dtSearch includes Unicode-compatible file parsing, to convert input data to Unicode. dtSearch supports hundreds of different international languages through Unicode. Some Chinese, Japanese, and Korean text does not include word breaks. Instead, the text appears as lines of characters with no spaces between the words. Because there are no spaces separating the words on each line, dtSearch sees each line of text as a single long word. To make this type of text searchable, enable automatic insertion of word breaks around Chinese, Japanese, and Korean characters, so each character will be treated as single word. dtSearch Developer API: set dtsoTfAutoBreakCJK in Options.TextFlags. Note: this setting will only affect text identified as Unicode Chinese, Japanese or Korean text; it will not affect text identified as other Unicode character sets. For documents in certain formats that do not include encoding information, such as single-byte text files, dtSearch provides a proprietary language recognition algorithm for detecting text in a large variety of languages (Western European, other European, Middle-Eastern, etc.). This algorithm is enabled by default. A search in dtSearch will always include white-on-white text and similar “invisible” text in files. dtSearch also includes options for searching embedded objects in Microsoft Office documents, and normally hidden content in HTML. While HTML comments, scripts, links, and styles are not by default included in indexing, dtSearch has an option to include these. dtSearch Developer API: Set Options.FieldFlags = to a combination of these flags: dtsoFfHtmlShowLinks, dtsoFfHtmlShowImgSrc, dtsoFfHtmlShowComments, dtsoFfHtmlShowScripts, dtsoFfHtmlShowStylesheets, and dtsoFfHtmlShowMetatags. A similar option searches hidden content (such as Macros or other embedded objects) in Microsoft Office files. dtSearch Developer API: This option is set by default. To disable it, set dtsoFfOfficeSkipHiddenContent in Options. FieldFlags. To easily distinguish among different search terms in search results, dtSearch now offers the option to highlight each search term or phrase in a search request in a different color. To enable this option, and to change the colors used for highlighting in dtSearch Desktop/Network, select Options > Preferences > Fonts and Color. For expanding a search for a specific set of word or words to a user-defined list of concepts or synonyms, dtSearch also offers a user-defined thesaurus add-on to the comprehensive English-language thesaurus included with dtSearch. dtSearch Desktop/Network: Click Options > Preferences > Search Options > User Thesaurus to add a list of synonym rings to a specific terms. A search report is good option for quickly going through a large number of retrieved files. A search report lists each hit found in each of the documents retrieved in a search with a specified number of words or paragraphs of context surrounding it. dtSearch’s Edit › Copy File function lets you copy all or selected documents retrieved from a search to a folder. You can optionally preserve the full path and filename in the copy, and you can preserve creation and last access times as well as the last modified date. Copy File also gives you the option of copying a single item in a container file such as a ZIP or PST archive, rather than copying the whole container. More information. The dtSearch Publish product can quickly publish forensically retrieved (or e-discovery retrieved) documents to portable media. The resulting product provides instant search and display access to the document set. The portable media can run with zero footprint, requiring no installation on the end-user's computer. Please see Mirroring Searchable Web Content on Portable Media article for an overview of how dtSearch Publish works.